Located in North-Central Vietnam, Quang Binh Province is surrounded by Ha Tinh Province on the north, East Sea on the east, Laos on the west and Quang Tri Province on the south. The provincial topography is narrow and sloping from the west to the east. The area is divided into specific geological zones: mountainous, hilly and midland, lowland, coastal sandy area. The seaside stretches 116km with large Gianh and Nhat Le ports. Quang Binh belongs to the monsoon-tropical zone. The climate is divided into two seasons. Rainy season lasts from September to March next year. The annual average rainfall is 2,000 - 2,300mm. Heavy rains concentrate in September, October and November. Dry season lasts from April to August. Annual average degree is 24 - 26oC. Quang Binh is famous for many charming landscape of mountain and sea. The coast is dotted with blue water, yellow sand beaches that sparkle under forests of green willow trees. Every year, Quang Binh attracts many visitors coming to interesting landscapes such as Phong Nha, Tien Son caves, primitive forest in Phong Nha - Ke Bang reserve, Nhat Le, Da Nhay beaches, Bang Mineral Hot Spring, etc. 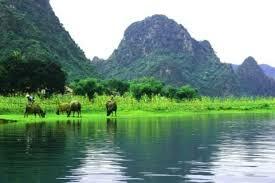 Among of them, Phong Nha - Ke Bang National Park has been recognized as the World Natural Heritage Site by UNESCO in 2003. In addition of these, Quang Binh preserves objects from Bau Tro Remains, Hoa Binh and Dong Son culture as well as historical relics like Quang Binh Gate, Luy Thay, Rao Sen... Many places related two resistance wars name Cu Nam, Canh Duong, Cha Lo, Cong Troi, Xuan Son, Long Dai and Ho Chi Minh Trail. Road, rail and shipping routes are fairly well developed. Dong Hoi City is 491km from Hanoi, 94km from Dong Ha, 166km from Hue, and 197km from Vinh. National Highway No.1A and North-South Express Train runs throw the province and stop at Dong Hoi City. Quang Binh has Cha Lo Border.